Very vague memories of this one. I was fourteen so was quite surprised that they let me in. I paid on the door and it seemed fairly empty. I think Bono threw a bucket of water out over the crowd. I went because I was told earlier that week how brilliant they were. I wasn't that impressed and still don't really care for them. I think this was the gig where the floor of the hall bounced enough to shake off tiles in whatever was underneath. It was - I was in the organ pit because the university always insisted we look after it and besides it was a great place to watch the gig from! The Ents manager Robin was so concerned about how much the floor was bouncing he even considered coming on stage to get me out of there! The tiles were falling off the ceiling in the lower hall and people were running out of the bar! 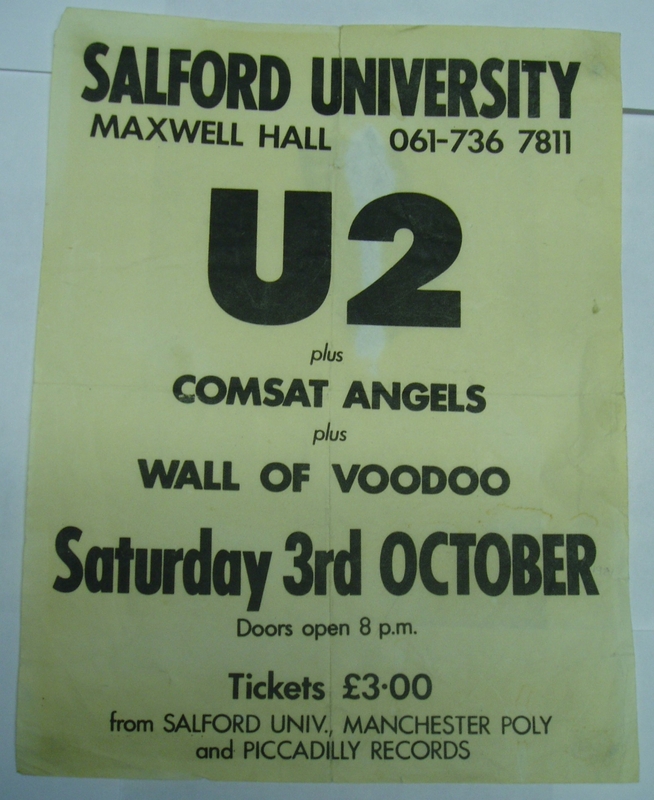 The reason U2 played the University when they could probably have played the Apollo was because the promoter owed us one! We were due to have U2 play in the smaller Disco Area with the Radio 1 Roadshow the previous term but they pulled out at the last minute because they wanted to stay in America a bit longer - we ended up with the Polecats instead! On the next tour they did play at the Apollo and luckily for me and my mate Brian they were supported by the Alarm who we'd met at a gig at the Uni so we went down there on the afternoon of the gig and hung about till the band put us on the guest list!! U2 were rubbish that night - I never saw them again! There's also an outside chance I made that flyer!